"John the Divine" and "John the Revelator" redirect here. For other uses of John the Divine, see John the Divine (disambiguation). For other uses of John the Revelator, see John the Revelator (disambiguation). For other people called Saint John, see Saint John (disambiguation). John of Patmos (also called John the Revelator, John the Divine or John the Theologian; Greek: Ἰωάννης ὁ Θεολόγος, Coptic: ⲓⲱⲁⲛⲛⲏⲥ) is the author named as John in the Book of Revelation, the apocalyptic text forming the final book of the New Testament. The text of Revelation states that John was on Patmos, a Greek island where, by most biblical historians, he is considered to be in exile as a result of anti-Christian persecution under the Roman emperor Domitian. Since the Roman era, some Christians and historians have considered the Book of Revelation's writer to be John the Apostle (John the Evangelist), professed author of the Gospel of John. However, a minority of senior clerics and scholars, such as Eusebius (d. 339/340), recognise at least one further John as a companion of Jesus Christ, John the Presbyter "after an interval, placing him among others outside of the number of the apostles". The majority of Christian scholars since medieval times separate the disciple(s) from Revelation's writer, John the Divine. The author of the Book of Revelation identifies himself only as "John". Traditionally, this was often believed to be the same person as John, son of Zebedee, one of the apostles of Jesus, to whom the Gospel of John was also attributed. 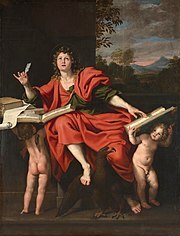 The early-2nd-century writer, Justin Martyr, was the first to equate the author of Revelation with John the Evangelist. Other early Christian writers, however, such as Dionysius of Alexandria and Eusebius of Caesarea, noting the differences in language and theological outlook between this work and the Gospel, discounted this possibility, and argued for the exclusion of the Book of Revelation from the canon as a result. The early Christian writer Papias appeared in his writings to distinguish between John the Evangelist and John the Elder, and many biblical scholars now contend that the latter was the author of Revelation. John was allegedly banished by the Roman authorities to the Greek island of Patmos, where, according to tradition, he wrote the Book of Revelation. According to Tertullian (in The Prescription of Heretics) John was banished (presumably to Patmos) after being plunged into boiling oil in Rome and suffering nothing from it. It is said that all in the audience of Colosseum were converted to Christianity upon witnessing this miracle. This event would have occurred in the late 1st century, during the reign of the Emperor Domitian. ^ Phillips, J. B. "Book 27 - Book of Revelation". 12 January 1962. People, Places, Customs, Concepts, Journeys - the New Testament with integrated notes and maps 1962. ^ Ehrman, Bart D. (2004). The New Testament: A Historical Introduction to the Early Christian Writings. New York: Oxford. p. 468. ISBN 0-19-515462-2. ^ Ben Witherington, Revelation, (Cambridge University Press) page 2. ^ Ehrman, Bart D. (2000). The New Testament: A Historical Introduction to the Early Christian Writings. New York: Oxford University Press. p. 432. ISBN 0-19-515462-2. ^ Robert H. Mounce, The Book of Revelation (Wm B. Eerdmans Publications) page 10. ^ Adela Collins. (1985). "Patmos" [In] Paul J. Achtemeier [Ed.]. (1985) Harper's Bible Dictionary. San Francisco, CA: Harper & Row. p. 755. This page was last edited on 8 April 2019, at 17:28 (UTC).